Time once again for my annual review of the new Fortune 500 list. In this article, I explore the relative profitability of the largest drug wholesalers, chain pharmacies, pharmacy benefit managers (PBMs), and pharmaceutical manufacturers. I also compare these groups to independent pharmacies. Most drug channel companies rank more highly on the Fortune 500 because they are bigger (in revenues) than pharmaceutical manufacturers. Drug channels companies are pretty profitable. 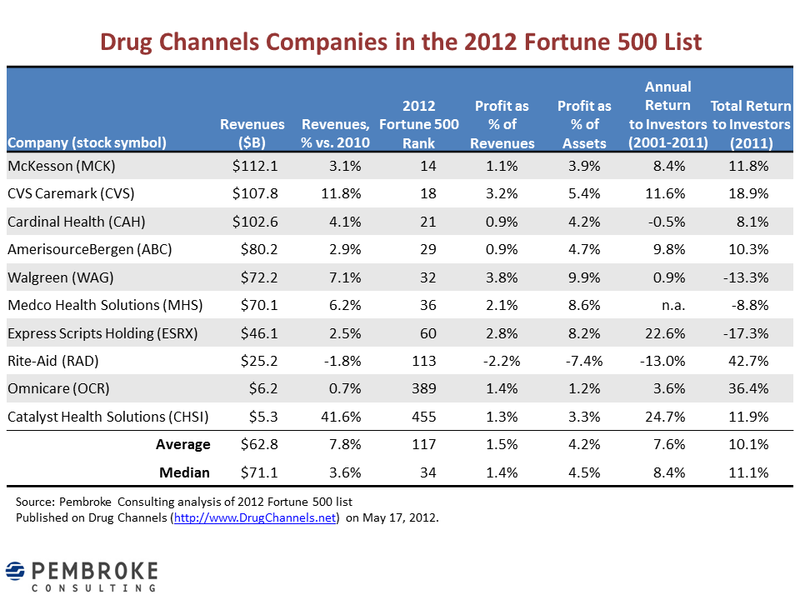 In 2011, median profitability of drug channels companies was up slightly vs. 2010. Beware of the "pennies in profit" fallacy, which reflects revenue double-counting within the channel system. Channel companies' profitability is about half of the profitability of pharmaceutical manufacturers when using an appropriate metric such as Return on Assets. In 2011, investors earned higher returns from drug makers than from the drug channels group. This is a switch from previous years, although the drug channels group outperformed manufacturers over the past 10 years. The profitability of a typical independent pharmacy is well above the median profitability of the 10 largest drug channels companies, including PBMs. The technical notes are at the bottom. Add a comment or opinion below. Enjoy! Here are the 10 largest drug wholesalers, pharmacy chains, and PBMs on the 2012 list along with Fortune 500 rank and links to the financial data as reported by Fortune. Note that Catalyst appeared on the list for the first time this year. Click here to view the 12 largest pharmaceutical manufacturers on Fortune's 2012 list. The channel intermediaries are much larger than the manufacturers. 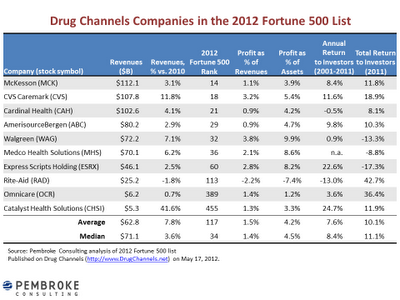 In 2011, median revenues for the 10 drug channels companies were $71.1% billion, up 3.6% vs. 2010. Median revenues for the manufacturer group were $18.4 billion, up 6.3% vs. 2010. Six of the drug channels companies are in the top 50 of the Fortune 500 list, while the highest ranking manufacturer (Pfizer) only reached #40. For comparison, the 12 largest pharmaceutical manufacturers on the Fortune 500 list have revenues ranging from $67.9 billion (Pfizer) to $4.8 billion (Celgene). Manufacturer A sells a pallet of WonderDrugium to Wholesaler B. Manufacturer A reports the net revenue from the sale on its income statement. Wholesaler B sells a case of WonderDrugium to Pharmacy C. Wholesaler B reports the net revenue from the sale on its income statement. Pharmacy C dispenses a WonderDrugium prescription to a patient. Pharmacy C is reimbursed via a combination of the patient's co-payment and reimbursement from PBM D. Pharmacy C reports the revenue from the prescription on its income statement. PBM D reports the reimbursement paid to Pharmacy C as "Network Revenue" on its income statement. As you can see in the table above, Return on Sales (ROS; profit as percent of revenues) was in the low single digits for all companies in this group, regardless of their position in the supply chain (retail pharmacy, wholesaler, or PBM). In 2011, the weighted average ROS (not shown) for the Drug Channels group was 1.8%, up slightly from 2010's weighted average of 1.7%. In 2011, the drug manufacturers’ weighted average profit as a percentage of revenues was a much more robust 15.9% of revenues (range: 8.8% to 33.4%). Thus, the manufacturer-to-channel ratio is 8.7X, i.e., the ROS for the manufacturers was about nine times the ROS for drug channels companies. ROS is a flawed measure of profitability for channel intermediaries due to the revenue double-counting. A more meaningful metric is Profits as a % of Assets, a.k.a., Return on Assets (ROA). ROA relates ROS to the balance sheet assets required to generate an income statement profit. The biggest part of a drug channels company's balance sheet are current assets (cash, product inventory, or accounts receivable), whereas the biggest assets of a pharmaceutical manufacturer tend to be long-term assets such as intangible assets, goodwill, or physical plant, property, and equipment. The ROA figures for drug channel companies now look closer to the pharmaceutical manufacturers, whose median profits as a percent of assets was 9.9% in 2010. The manufacturer-to-channel ratio is only 2.2X for ROA, about the same ratio as last year. The difference in part reflects the innovation/risk premium associated with the expensive, risky, and time consuming business of drug discovery. Pharmacies, wholesalers, and PBMs wouldn’t exist unless manufacturers actually created valuable and innovative drugs. These figures are somewhat surprising given the rhetoric from independent pharmacies about the profits of PBMs and manufacturers. In reality, a private independent pharmacy is more profitable than the large public PBMs. You know my motto: Everyone is entitled to their own opinions, but not their own facts. Sorry to be the bearer of good news! In contrast to prior years, 2011 investment returns at manufacturers beat the drug channels companies. The drug channels group outperformed manufacturers during the 2001-2011 period. For consistency, all data come from Fortune's measurement of key financial metrics. Click here to review Fortune’s methodology. I only include Drug Channels companies that earned a majority of their revenues from pharmaceuticals. This criterion excludes other retail formats with pharmacies (supermarkets and mass merchants). I do not separate the revenues from each company's various lines of business. The ROA for independent pharmacies is computed as (Average Operating Income / Estimated Average Assets) using data from the 2011 NCPA Digest. Adam: This is very useful. Your skill as an economist is quite evident. It is, howvever, worth noting that profit as a percent of sales for ESI, Medco and Caremark is really much higher, because these PBMs use 'top-line' revenue as the denominator. By doing so, they can characterize themselves as low margin businesses. It is far more realistic to divide their profit by service revenues. Doing so would reveal that they are actually astonishingly profitable. Their profit per claim is much more than the pharmacies earn. This is precisely the "pennies in profit" fallacy. For example, ROS for wholesalers looks puny, which is why I prefer a non-traditional metric such as "EBIT as a % of Gross Profits." See Wholesaler Profits in the Generic Wave. Fortune's ROA computation is a more appropriate benchmark for intermediaries of any kind (PBMs, wholesalers, or pharmacies). The PBMs looks pretty good on this metric, but still not as good as small independent pharmacies, which have a very low assets base. You mention that Pharma has a high risk than drug channel companies thus justifying the higher return. I contend that most independent pharmacy owners also have a higher risk than our channel competitors. They do not have the diversification and scale that these large competitors use to manage risk. Also the initial investment ties up a large percent of personal wealth. This risk and large investment should have a higher return. Your thoughts? Do you really believe that the NCPA digest represents the entire universe of retail pharmacies in the USA? My guess is that it's weighted pretty heavily toward those with profitable operations. 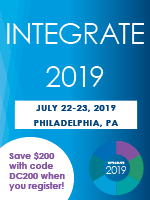 I never said that the NCPA Digest includes all pharmacies, any more than the 10 companies in the Fortune 500 represent all wholesalers, chain pharmacies, or PBMs. The NCPA data are averages, so about half of pharmacies will be below the reported numbers. That said, I'm not aware of any alternative data for independent pharmacies. Plus, the NCPA Digest data are used regularly to describe the industry and lobby Congress, so those data are fair game, IMHO. counterparts” and our highest expense is salary (owner pharmacists and employee pharmacists) as a percent of revenue. is a stretch of anyone’s imagination. Sorry, I don't get your point. I used standard financial analysis to compare relative metrics of profitability, not total profit dollars. I guess you missed this session on financial benchmarking at the 2011 NCPA Annual Conference. Actually, being an OWNER (vs.academic) of a retail business I am quite fluent in benchmarking. 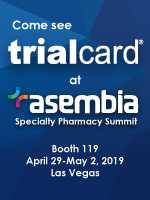 I believe the intent of the NCPA session was to use ROA to assess an independent pharmacy's finances or to compare those numbers another independent retail pharmacy. It was NOT the intent to compare an independent pharmacy to any other business model. Said another way, using ROA works when comparing apples to apples, not apples to oranges. Or, this case, good apples (indy) to a bad apples (PBM).